It is fair to say that Sidney Nolan was the most travelled of all Australian artists. He explored every continent, including Antarctica, with the eyes of an artist and until 1976 was aided in this pursuit by his literary-minded wife Cynthia who published a number of illuminating books based on their shared experiences. 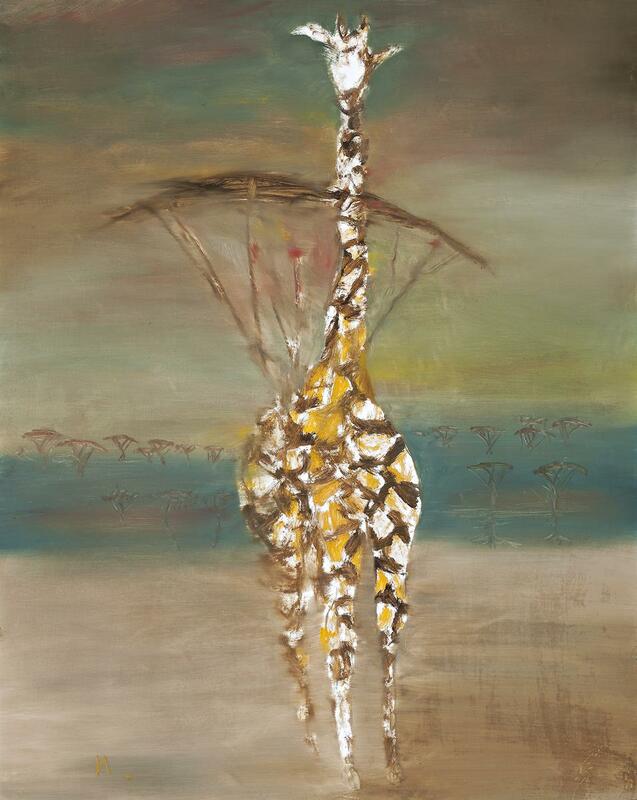 Giraffe, 1963 is one of the earlier paintings in a sequence Nolan created inspired by the couple’s three-month odyssey through Africa between September and November 1962, an often-fraught adventure captured vividly by Cynthia in One Traveller’s Africa (1965). It was also the first collection of paintings by Nolan in which he abandoned his long-term use of Ripolin enamel in favour of pure oil paint. The offer of the sponsored journey to Africa came from Lilian Somerville, Director of the Fine Arts Department of the British Council, who contacted Nolan ‘after she had been approached by a wealthy Kenyan named Malin Sorsbie, who wanted to know if there was a prominent artist in England who would accept a commission to interpret some of the frontier aspects of Africa.’1 On their arrival in Kenya, Sorsbie proved to be a belligerent game-hunter, ‘a great bull of a man with a scarred face’,2 and an immediate, reciprocal dislike occurred. In spite of this inauspicious beginning, the Nolans flew to the 14,500 square kilometre Serengeti National Park for their first encounter with wild animals. Cynthia quickly recognised that ‘the best time of day here as elsewhere was between five-thirty and seven p.m., for it was then that one had the chance of entering the miraculous hour, or two hours, of painter’s light – a time when the sun’s rays slant, illuminating and revealing the world.’3 Indeed, as that first dusk approached ‘(t)he sky at last became sufficiently dark to show up the paring of a new moon; but an early star over the flattened acacias was a giraffe’s eye, which had caught the reflection from the car’s headlights.’4 Judging from this description, it would appear that Giraffe was Nolan’s painterly attempt to catch this particular spectral vision as it had first appeared to him on that Serengeti evening. Nolan started the painting with a dramatic cross scoring of white, brown, yellow and black to capture the pattern of the giraffe’s pelt. He then built up the background with a combination of dilute and pure oil paint applied with a broader brush, ‘scuffed and polished with a cloth’;5 and employed other tools such as his fingers to articulate the hooves. Nolan described the visual sensation he was after as one of attempting ‘to see the animals as they see one another. As blurred and menacing’;6 and Giraffe displays an equivalent mood of haze, wariness and flickering movement. At the first exhibition of the series at Marlborough Fine Art, London, the paintings ‘sold like hotcakes’,7 and buyers included Her Majesty Queen Elizabeth the Second, Sir Kenneth Clarke, American philanthropist Edwin Jaffe, and Colin Tennant, 3rd Baron Glenconner, the aristocrat owner of the island of Mustique. With such public acclaim and patronage, it is not surprising that six months later, Nolan was awarded the Commander of the Most Excellent Order of the British Empire (CBE).